Thanks to over 30 members of the TB Support Group who have given their data and experiences of bTB in their herds. It is from the information gathered from the data provided by these members that has produced much of the advice contained on this website. Thank you. Also thanks to senior members of DEFRA/AH/and the VLA for working closely with the TB Support group. It is a relationship very much appreciated by us all. No images, data or any part of this website may be used for commercial purposes. Advice and information on this website is given in good faith. It is essential that you consult your Vet and/or AHO before making any decisions on diagnosis or treatment of your animals. We make every effort to keep official documentation up to date but where guidance is given on official policies, please bear in mind they may have changed so you MUST check and confirm current policy and procedures with DEFRA/AH. Advice and updates will be posted as and when information becomes available to us. a high bTB risk area? Can alpacas and llamas get bTB? No. If they have bTB legally they must be culled. Can they pass it to each other? Yes - and to other species including people. BTB is a zoonotic disease that crosses species. Is there a test for bTB incamelids? Yes. Skin tests and blood tests. The skin test is very poor at detecting disease, but enhances the effectiveness of the blood tests. Depending on how the blood tests are applied and read, they may only have just over a 50% chance of detecting the disease so are no guarantee or freedom from disease, however not testing at all gives you a zero chance of detecting TB. Testing is available from through your vet though APHA and a private company. Since this website was created in 2010, some things have changed, but TB remains as serious a threat as ever. From a position where there were no reliable tests available, there are now blood tests that help in the detection of bTB. It must be understood however that there are different ways in which the tests are applied and interpreted, which can mean that on any one animal they may have only around a 50/50 chance of detecting the disease. If you don’t test at all though you have zero chance of detecting the disease, so testing is one of the ways forward. The application of blood tests and the stronger legislation will hopefully find and remove infection from those herds that have had an ongoing TB problem which in some cases has led to the spread of infection to other herds through animal movements. One thing that hasn’t changed is the need to risk-assess any contacts through movements and purchases. Consider where you are buying from carefully and ask In WRITING whether TB has been a problem in the vendor herd. This allows you to make your own decisions and request blood tests. Be aware that the disease is real and present, and has the ability to kill your alpacas. 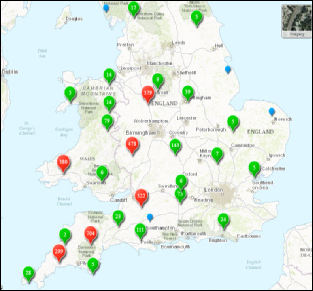 Click on the map above to visit the Defra interactive bTB map. You can enter your location (or the location of herds that you have contact with) by postcode and zoom in or out to see the prevalence of bTB in your area or the area where you are buying from, obtaining matings from or agisting your alpacas. Use the information to make your own informed choices and assess the risk to your herd. Tests are available to help protect your herd - test and quarantine before you introduce new animals. Remember - no test is a guarantee and biosecurity and risk assessment is as important as ever.